Integrating your Access Database with Google Earth can be a powerful addition to your database. 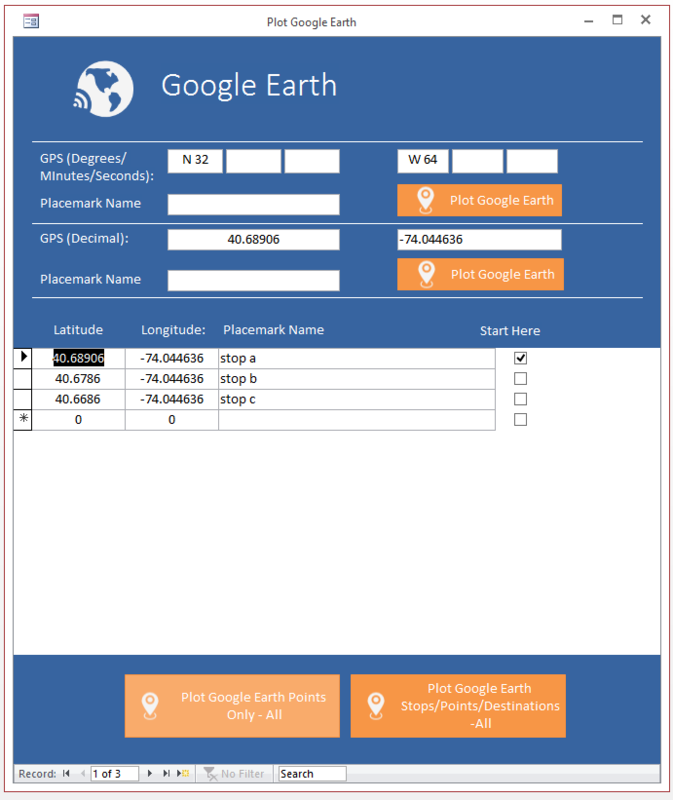 The Microsoft Access Google Earth Database is a full featured database that allows a user to input a GPS coordinate in either decimal or degrees/minutes/seconds. It then has the capability to plot a Google Earth map from within your Access database. The template database also has a sample showing how to generate a Google Earth map with multiple stops/destinations. Download a demo version for free to try out. The demo version is in Access 2007 which will work on either Access 2007, 2010, 2013, 2016, 2019 or Office 365. If you need a previous version of Access to tryout, please Contact Us. Please note that the demo version of the software is fully functional, but doesn't allow you to make any modifications to the form design and VBA Code - the full version of the software available for purchase gives you the full source to modify however you want. $99.99 for unlimited developer use - this allows you to use this database template however you wish for any applications you develop and distribute.